I’m usually not a huge ribs fan, however, when I saw this recipe it peaked my interest and I decided to tweak it a bit to my liking and give it a try. This recipie is super easy and all you need are a few ingredients for the rub (most of which you probably already have in your pantry). Enough talking, lets get started. Wash and pat ribs dry. In a small bowl combine all your dry ingredients then whisk gently to incorporate. Next, coat ribs in olive oil and apply the dry rub. 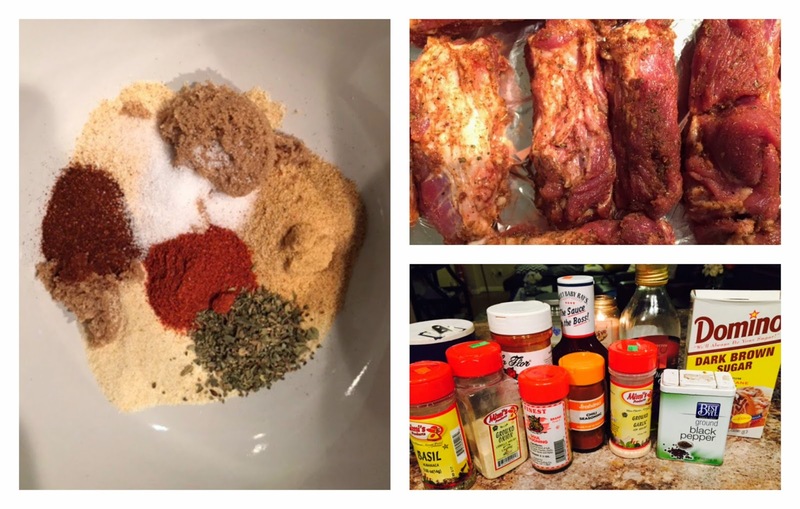 Gently massage the rub into the ribs ensuring seasoning is spread throughout. Once ribs are sealed place in oven on 290 degrees. These babeies are going to bake slow. Bake for 2 hours and check for doneness. Once ribs are tender to the touch, remove foil and drain off any fat in dish and brush ribs with desired amount of bbq sauce. Place ribs back in the oven and turn the temparture to broil. This will allow the ribs to get nice and crisp on top and the sauce will stick to the meat. Keep a close eye on the ribs as this should take about 5 mintues. Once complete, serve with some mash potatoes or a nice potato salad! Would you try this recipie?